Since its presentation during the summer, the new stadium design has been refined by Populous to gain more appeal. Still expected to make use of San Diego’s climate and lifestyle, this bid for future NFL venue is now much detailed and realistic. Will it be enough to convince Chargers to stay in Mission Valley? The team, who have recently announced they plan to file for relocation to Los Angeles in January, have long said they prefer a downtown location for a new football stadium. 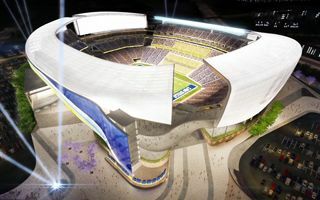 Some of the features of this design include 70,000 square feet of party decks in the end zones, video boards that would be the largest in the NFL and a canopy around the stadium lit up by LED lights that could change color and design. Parts of the façade would be kinetic (wind-powered), mimicking the Ocean waves. The stadium will have 7,500 club seats, 50 loges and 120 suites to complete the final capacity of 67,500 people. For large events like the Super Bowl it could grow to roughly 73,000.